We're your ultimate source for the best tire deals in London! 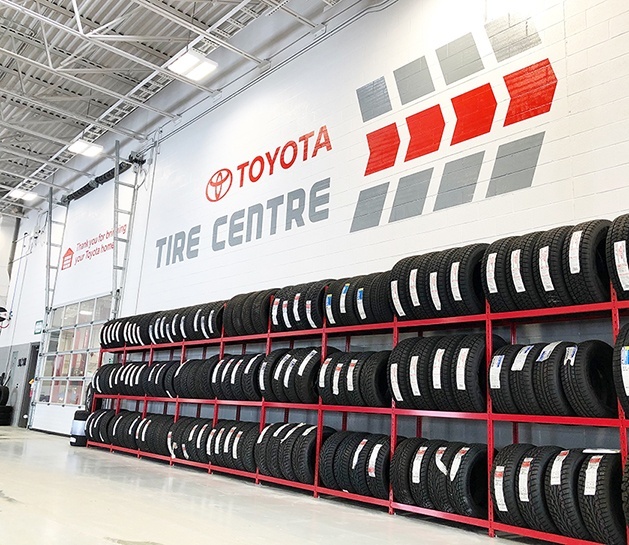 North London Toyota's Tire Centre offers a wide selection of all-season, summer and winter tires at a competitive price. Our Tire Specialists have been trained to ensure that you're receiving the right fit for your Toyota, at the best price. Purchasing new tires from North London Toyota is easy with our instant price quote tool below! Choose your vehicles year, make, model and trim level and receive an instant quote on popular brands such as Pirelli, BF Goodrich, Firestone, Toyo Tires, Michellin, Good Year and more! Purchasing a New Toyota or Pre-owned vehicle? Ask your Product Advisor to include the price of new tires into your payment! Questions About Tires? We Have The Answers! You should inspect your tires regularly for uneven wear, looking for high and low areas or unusually smooth areas. Also check for signs of damage hat could lead to you needing to replace your tires. Ask a member of a staff to take a look if you're concerned about any of your existing tires, we'd be happy to take a look. Why should I use winter tires instead of all-season in the winter? Why are steel rims a better choice for winter?